Angularjs Directives are markers on a DOM element (such as an attribute, element name, comment or CSS class) that tell AngularJS’s html compiler ($compile) to attach a specified behavior to that DOM element or even transform the DOM element and its children. For example, The ng-app attribute is a directive, so is ng-controller and all of the ng-, ng:, ng_, x-ng-bind, data-ng-bind prefixed attributes. 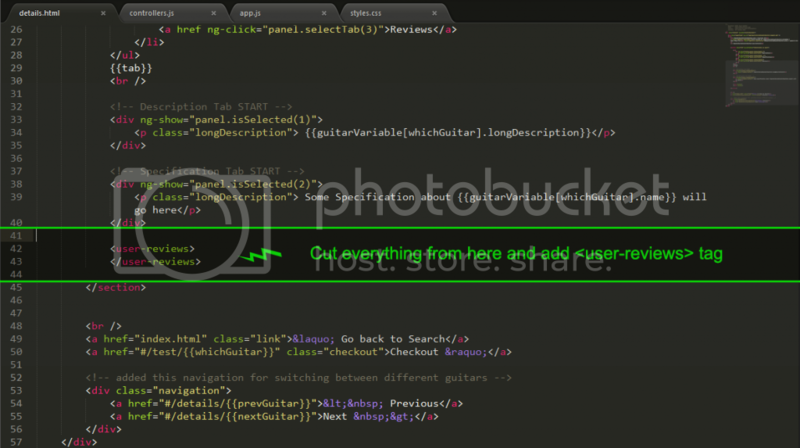 In the html file write following element tag. This tag will hold code snippet. When we want to use specific code we simply write such tags to include that code. Then in the JS file, write following lines to make above angularJS custom directive work. Like app.controller we defined app.directive then defined guitarReview which is the name of element tag that is being used in html but have you noticed that guitar-review is different from guitarReviews? This is because guitar-reviews’s hypen is converted into camel case so it becomes guitarReviews in js file. Next is an anonymous function which is returning something. restrict: ‘E’ says that we are defining a custom Element directive and templateUrl is pointing to code snippet file that has to be included. In the html file write following attribute inside html tag. This tag will hold code snippet. When we want to use specific code we simply write such tags to include that code. Note: AngularJS recommends that you leave simple css and normal comments instead of custom directives for css and comments. Lets implement custom directives in our angularJS app. You can download project files here. I want to put reviews section code in a separate file and then gonna assign an element to that code snippet and use it in details.html page. Our <user-reviews> directive name here is userReviews in camel case and hyphen is gone. 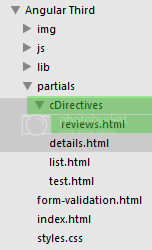 Next we are saying that restrict that directive to element E and when it is called load the file in templateURL. We just made a custom element directive. Although, you see no change in application but now our code is well managed than before. Can you make custom element directives for description and specifications? Do it yourself. Interesting part: you can add styles to user-reviews via css like the way you assign style to a div.